I don’t know Jeremy Corbyn well enough to know whether he goes very big on soul-searching. But he should be searching deep right now, and asking himself how, under his leadership of the Labour Party, the charge of anti-Semitism has been allowed even to get off the ground. When I first arrived in London in my early 20s, and moved in with my partner Fiona at her parents’ home, a highly active Labour household, Jewish Labour members were a big part of the scene. Ian Mikardo, the son of Jewish refugees who had become an MP, was a regular. Jews rich and poor were among Labour activists. True, many wealthier members of the Jewish Community may have been likelier to put their money behind Margaret Thatcher’s Tories, but that too changed over time. When we first coined the slogan now used by Mr Corbyn – ‘for the many not the few’ – yes, it was saying that we stood up for those who were poor and struggling, and for the majority of hard-working people trying to do the best for themselves and their families. But it wasn’t just about the poor. We were proud that people who had done well for themselves and wanted to support our plans for social justice saw themselves as part of the Labour ‘many’ too – and they helped us to win three elections in a row, including in places Labour had never dared to dream of winning in the past. Some of the very Jewish areas of Mrs Thatcher’s old stamping ground in North London come to mind. 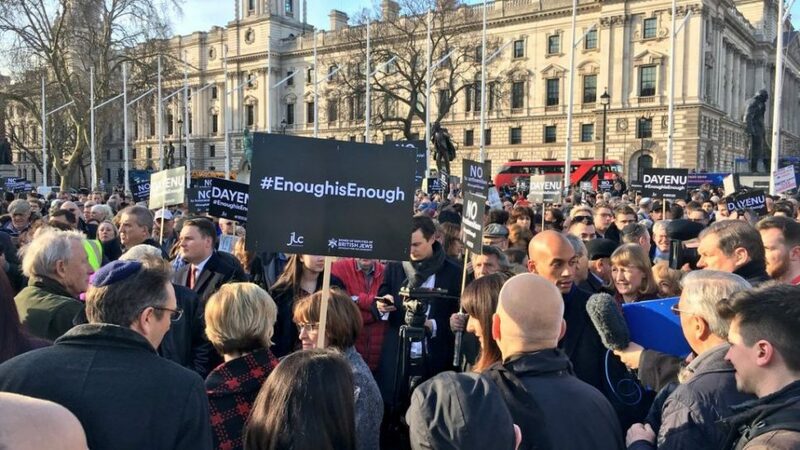 Even accepting that people at protests might go a bit over the top with their messages on posters, to those who worked so hard to win over the Jewish Community to Labour’s cause, it was heartbreaking, and horrifying, to see that New Labour and Corbyn Labour slogan bastardised as ‘For the many not the Jew.’ How on earth has it come to this indeed? It has come to this because it has been allowed to come to this. Because the early signs were not spotted, and when they were, by others, they were not taken seriously. And even when it looked like they were being taken seriously – inquiries, Ken Livingstone’s suspension – the underlying issue was not fully addressed. David Miliband, another son of Jewish refugees who became a Labour MP, did not mince his words last night when criticising ‘the veil of unctuous denials, whitewash reports and diversionary attacks’ that have characterised Corbyn’s handling of this. It is not enough for Corbyn supporters and apologists to say this is all a smear, that there is anti-Semitism in all parties, that he has fought all his life against racial and religions discrimination etc etc etc … you hear too many stories of anti-Jewish remarks at meetings, of people deliberately mixing up the issue of the Jewish faith and Israel, of jibes about Jews and money, which is why the controversy over the anti-Semitic mural initially defended by Corbyn became the Jewish Community’s tipping point into protest and activism outside Parliament. A lot of the anti-Jewish talk, coded and otherwise, comes from the new supporters, and the old hard left, brought into the party by Mr Corbyn’s appeal. He may not have turned on the tap himself. But he has to take responsibility for turning it off. And actions will have to speak louder than his words. The flurry of statements from Mr Corbyn and his team suggests the protest has at least caught their attention. He is usually the one on the protest, not the object of protest, and he clearly doesn’t much like the feeling. Even so, you could feel the reluctance as the words were dragged out of them day by day to say a little more of the kind of thing they don’t really like to say, like, we may have got this wrong. It all felt, frankly, a bit weaselly. Coincidentally, I have been reading a remarkable book, Holocaust, by Laurence Rees. We all think we know the Holocaust story. In general terms, we do. Hitler. Six million Jews. Gas chambers. But it is only when you get into the real, horrific detail, meticulously researched, that you see the full enormity, and why we should all be reminded of the Holocaust story at regular intervals in our lives, so that those all too often hollow words – ‘it must never happen again’ – actually mean something. More revealing than the horrors we all know are the signs that were ignored and tolerated, the experiments that were allowed to go without challenge, the attitudes that were allowed to fester and then turn into violence and hate, leading to an at first slow but steady, then breathtakingly rapid descent into utter barbarism, and not just by the Germans. With two nationalist authoritarians now in the White House and in the Kremlin, with the world still recovering from an economic crash, hatred of minorities and immigrants growing in too many parts of the world, displacement on the rise, there are too many parallels with the 30s in our world already. I am not remotely comparing what is happening in Labour now to what happened in Germany back then. But I am saying that given the history of anti-Semitism, and where it ended, there can be no tolerance of it at all, at any level, ever, by anyone. And don’t let anyone pretend it is not possible to separate out Israel’s government from Jews around the world, because it is. So soul-searching required. But if we look at the Corbyn response to another issue recently, the Salisbury poisoning, you see something of a trend that suggests maybe he doesn’t do the soul-searching stuff. He uses events happening today to justify his stance on events in the past. In one of the most bizarre pieces of ‘whataboutery’ of recent times, Theresa May identifying Russia as the likeliest perpetrator of the attack was used to remind people Corbyn had been ‘right about Iraq’. So he and the posh boy revolutionaries in his ear, like Andrew Murray and Seamus Milne, don’t want to say anything that suggests they may have been wrong about Russia, wrong about Israel, wrong about New Labour, wrong about anything. I look forward to their supporters asking me to do some soul-searching on Iraq, pretty much their answer on anything I might say by way of comment on their leadership. But on this question of anti-Semitism in the Party, and how we got from where we were to where we are, there is something very wrong indeed. Corbyn needs to see it, say it, sort it. Because at a time so many people feel he is badly letting down the Party and the country on Brexit, (on which more in this week’s New European) he has already let down Party and country in allowing the anti-Semitism charge not just to get off the ground, but to fly so high. PreviousThe whiff around Cambridge Analytica is getting stronger, and getting closer to Leave campaign. Keep going Carole! When you comment about “where we were” care to remind us who released posters depicting the Jewish Tory Michael Howard as a pig, and as Fagin. Who also followed up questions with the reply “cover something important you twats”?